It was just after that happy visit of which I told at the end of "WhatKaty Did," that Elsie and John made their famous excursion to ConicSection; an excursion which neither of them ever forgot, and aboutwhich the family teased them for a long time afterward. The summer had been cool; but, as often happens after cool summers, the autumn proved unusually hot. It seemed as if the months had been playing a game, and had "changed places" all round; and as if September were determined to show that he knew how to make himself just as disagreeable as August, if only he chose to do so. All the last half of Cousin Helen's stay, the weather was excessively sultry. She felt it very much, though the children did all they could to make her comfortable, with shaded rooms, and iced water, and fans. Every evening the boys would wheel her sofa out on the porch, in hopes of coolness; but it was of no use: the evenings were as warm as the days, and the yellow dust hanging in the air made the sunshine look thick and hot. A few bright leaves appeared on the trees, but they were wrinkled, and of an ugly color. Clover said she thought they had been boiled red like lobsters. Altogether, the month was a trying one, and the coming of October made little difference: still the dust continued, and the heat; and the wind, when it blew, had no refreshment in it, but seemed to have passed over some great furnace which had burned out of it all life and flavor. In spite of this, however it was wonderful to see how Katy gained and improved. Every day added to her powers. First she came down to dinner, then to breakfast. She sat on the porch in the afternoons; she poured the tea. It was like a miracle to the others, in the beginning, to watch her going about the house; but they got used to it surprisingly soon,—one does to pleasant things. 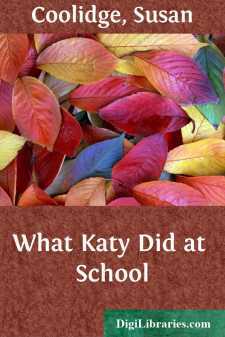 One person, however, never got used to it, never took it as a matter of course; and that was Katy herself. She could not run downstairs, or out into the garden; she could not open the kitchen door to give an order, without a sense of gladness and exultation which was beyond words. The wider and more active life stimulated her in every way. Her cheeks grew round and pink, her eyes bright. Cousin Helen and papa watched this change with indescribable pleasure; and Mrs. Worrett, who dropped in to lunch one day, fairly screamed with surprise at the sight of it.